I have been a big fan of Zatana since I first saw her on one of the DC animated shows. There was just something about her character that hooked me from the start. Maybe it was the whole reverse word magic. Or maybe it was her backstory, I don’t know exactly. 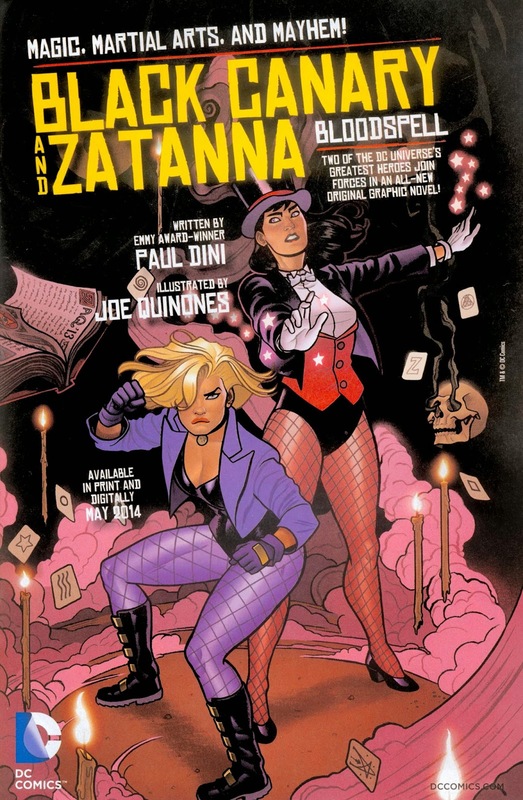 I just know that before the new 52 Dini was writing a Zatana solo book that was perfect. It was a shame that it got cancelled because of the New 52. As far as Black Canary, I have read a little bit of Green Arrow, but that’s pretty much it. When I heard about the release of this trade I knew I had to read it. The series starts from the first time the two characters meet. Zatana is taking a right of passage for the Homo Magi in the Himalayas as a kid. She levitates herself up to one of the higher peaks before looking down and panicking. The brief lack of focus causes her to land right next to a certain blonde practicing Tai Chi on the peak. The chance meeting starts a great friendship that lasts many decades. From there it jumps to one year before the present where Dinah stops the robbery of a casino by taking the place of one of the women who is part of the heist who didn’t trust Tina, the woman who put the job together. Before the heist Tina has the girls in the crew all participate in a blood bond ritual. After stopping the crime, Dinah and the Tina have a death defying fight through the skies over Vegas. Ending in Tina killing herself just after speaking a incantation. In the present the other women who were part of the heist start dying one by one under strange circumstances, leading Black Canary to believe that Tina’s ghost is killing off the women who wronged her including Black Canary. The paranormal feel to the deaths causes Dinah to turn to her pal Zatana for help. This is a really fun read. Dini has an excellent feel for these characters in every facet of their lives. It is that feel that gives him the ability to give them great little moments where they make poke fun at themselves. My favorite of these moments is Zatana and Dinah go to the mall to vent from there stresses. They are leaving a lingerie store commenting on how they buy fishnets so often they should be getting discounts on them. Throughout the book there are points where it jumps back to various moments throughout their friendship. From Zatana’s first mission with the Justice League, to a run in with Granny Goodness and her cohorts. It is books like this that make me wish that the New 52 never happened and that Paul Dini would write more books. Joe Quinones does an amazing job on art. Quinones often evokes the style of the Dini-verse shows, which makes the book shine even more. It is a real treat to get to see him draw both characters in their different costumes they have worn through the years. Some of the humor also spans from their past outfits. This is a rare gem in the modern DC landscape to me. The writing is dead on and the art is beautiful. Once again this was a really fun read. and it is a quick read. My only complaint about the book is that it went by so quickly. I could read an ongoing series of this duo done by this creative team. Thanks for reading my review. If you have any comments or suggestions on how I can improve my reviews. Or on other books to read feel free to leave them in the comments section.